I’m just starting out so a squeeze chute isn’t exactly in my budget right now. I’ve been looking around at just head gates. For the people that just use head gates, what is your setup like? What type/brand head gate do you have? Thanks a bunch for any input! Lots of us use or have used a head gate only. They work very well, most of the time. Buy a good one and keep it rust free. Should last until money can be saved. Problem with head gate only, most have a set width alley. A stuck cow is a problem. Priefert makes a good and popular headgate. And just about everyone here understands about budgeting. Sometimes we do what we can afford. 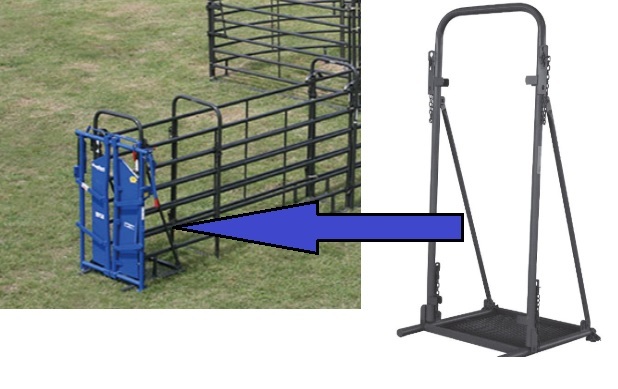 Install two 8' bull gates directly behind the head gate and you can pretty much do anything that's needed. I have an old Tox O Wik that has been in for probably thirty years and seen a lot of cattle.It's starting to loosen up now but it's paid for and if it fails tomorrow,it has done it's job.I built it into a homemade alley with an 8' foot gate on the right side to allow me to get to a cow's side and feet.Handy when helping a calf who needs to learn to nurse. A dedicated squeeze is nice but there are thousands of head run through the older type.Neighbors have three similar.Wish they had put side gates in but they didn't ask me nor ask me to pay for it. Priefert HG91 headgate mounted to GOOD wooden posts or (better) steel posts, or (easier but more expensive) to a Priefert headgate stand will work, but even with the headgate stand, you will need to plant at least some good teeposts along each side of the stand. I used one just like that without a squeeze for several years and it worked fine. Headgate stand alone will run you over $400 but you can make one cheaper than that. I like a good automatic catch, but its not necessary, what is necessary is the ability to reroute them back to the working area, if they get missed. Concentrate on that, Because they get missed, automatic catch or manual. Wow thanks for the great advice everyone! Y’all are great. The purpose of the flat grid at the bottom of the head gate stand is to keep the cow from pulling the HG up. Kinda hard to pick something up and running off with it when you're standing on it.. I never had it happen but read somewhere that someone had one pull up or break the wooden posts off that the HG was mounted to and it ran off out in the pasture with the HG still around it's neck. I second this advice. I started out with the corral style that rotate and hated it. I upgraded to the HG91 and it's been flawless. I believe it'll work with Prieferts squeeze chutes also so if you do upgrade later down the road at least you'd already have it. On my farm due to the fact that I hate wood I started by building my head gate into my pen run. I put ten foot water pipes into the ground four feet and pour concrete in with them. These old sprinkler pipes are solid. I welded my head gate on to them then eyelets every ten inches from the top down. using the torch I burnt 3/4 holes in the rest of the post in the line then welded eyelets to the other end post. Half inch steel cable was put thru all the holes with a Flemish eye on one end and a turn buckle on the other. Lifetime fencing with no broken boards. The run is 28 inches wide and the same thing was done for my cattle pen with ten foot gates to let them in and out. This allows me to open gates in the direction I want them to travel either out to the field or into the head gate. The head gate has two gates attached to the front to either return to the pen or field or straight into the trailer. If I had to buy all the material at cost it would kill me but I get the old pipes cheap and the cable for free as it is old tugger cable from a mining company. My pens are 40 by 40 for the cows and 30 by fourty for my stockers and bull. This year im finishing my birthing pen which will allow my cows 20 by 40 and a private ten by 8 lean to have their calves in. After visiting a number of cattle sales yards I realised they have no trouble moving critters with their gate cable system so I copied it for my farm. This summer I am going to start running cable thur my wooden fence post to slowly replace the electric fence where I shuttle cattle to different sections of my bush and pasture. Saw that happen with a 2,000# bull. Talk about a train wreck.